Houston, we have no problem here. Like many other larger American cities, Houston has a somewhat apathetic metal scene, but certainly not for a lack of talented bands and musicians, so when a band from the area breaks out of the pack and begins to enjoy some success, it is definitely time to stand up and take notice. One of these bands is Azrael’s Bane. Hailing from H-Town and comprised of some of the best musicians in the greater metropolitan area, this band is proof positive that when you put a band together of top caliber players, good things are bound to happen. After years of paying their dues in and around Houston in their former bands, the band formed in 2002 and immediately began playing shows around the area. 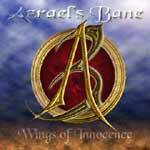 Their debut CD, Wings of Innocence, released in 2004, is up for review today. I have read other reviews of this CD already and they have been compared quite frequently to Lillian Axe in their style of play. I would like to take that one step further and say that they are more like Lillian Axe meets Queensryche with a dash of Fates Warning and Dokken thrown in for good measure. This CD is a fantastic collection of melodic rock tunes, complete with multiple tempo changes, great guitar riffs and vocal harmony not seen since the days of Stryper. That’s right, I said Stryper. You can bash the Christian metallers all you want, but when it comes to the harmony they employed, they were absolutely unmatched in the rock world and Azrael’s Bane ranks right up there alongside them. From beginning to end this CD is very solid, both from a musical and a productional standpoint. My personal favorite track, “Rainbow’s Edge,” has a definite old-school Queensryche groove to it, like something you might have heard from Rage For Order, while other tracks like “Mercy” and “Lie to Me” have a Lillian Axe-style appeal to them. When you put this CD in your stereo you are compelled to reach for the volume and turn it to 11. I have known a couple of the band members for a little while now and can definitely see progression in their talents over the years. Guitarist Jeff Clifton is an absolute phenomenal player and the influences of George Lynch, Yngwie Malmsteen, Chris DeGarmo and Steve Blaze totally permeate this CD. Throw in the awesome vocals of Trey Gadler with his Ray Alder (Fates Warning)/ Geoff Tate style of singing and you have a one-two punch of high energy passionate music. As I mentioned above, the total production and sound mix of this CD is top notch and as near to perfect as you can get. The CD itself is laid out nicely, with the booklet having a nice foldout with all the lyrics inside. You don’t expect this type of quality from a local band, but you have it with Azrael’s Bane, and since its release they have generated a lot of buzz in the metal community, not just in Houston, but worldwide, especially in Europe where they have been getting a very decent amount of airplay. So much so that they recently signed a worldwide distribution deal with Sentinel Steel Records as well as Houston-based Perris Records. If you’re a fan of killer melodic rock, then you cannot pass up this release. Check out samples at www.azraelsbane.com and see for yourself. Look for 2005 to be a big year for the ‘Bane! I don’t give 5 stars very often, but when I do it is deserving.